Toshiba Group's Corporate Philosophy emphasizes respect for people, creation of new value, and contribution to society. The Group slogan – “Committed to People, Committed to the Future. TOSHIBA.” – expresses the essence of our corporate philosophy. We recognize that it is our corporate social responsibility (CSR) to put our philosophy and slogan into practice in our day-to-day business activities. In doing so, we accord the highest priority to human life and safety and to compliance. As a part of Toshiba Group, Toshiba Africa is continuing to involve the local community through various activities. Toshiba is supporting Save the Children Japan's early childhood development project in the Shinyanga area of Tanzania. Our colleagues in Japan contributed to this project during Toshiba Group’s Simultaneous Social Contribution programme in 2014 December – donating a total of 10 million yen, which was then matched by the other Toshiba companies. This donation has been used to build and operate ten community childcare facilities in Tanzania. These community childcare facilities foster caring, educational environments that support the upbringing of 1000 children, and provide meals that help improve nutritional standards. to those affected by the flood. Through FoodBank South Africa, Toshiba is sponsoring two organisations – The Carpenter’s Shop in Cape Town, which focuses on skills development, and Kuyasa Soup Kitchen in Johannesburg Township Tembisa, which runs a daily soup kitchen. The Carpenter’s Shop provides short-term rehabilitation services, training and accommodation to people in need so that they can re-integrate into society. It is committed to providing academically disadvantaged people with skills for entry-level jobs, so that they can gain independence in their lives. 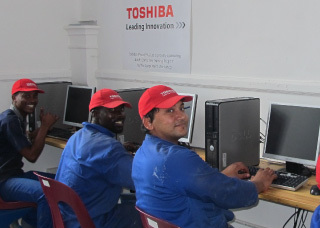 Toshiba helped set up facilities for their new adult computer training course in 2014 as part of our socially responsible activities. Together, Toshiba employees in South Africa created T-shirts to donate to Kuyasa Soup Kitchen in Tembisa, Johannesburg as part of Toshiba Group’s Simultaneous Social Contribution 2014. 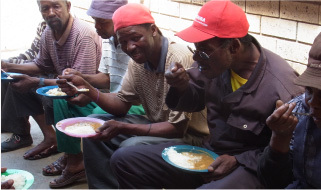 Kuyasa Soup Kitchen provide cooked food to unemployed, elderly and HIV positive people in the community. We hope the T-shirts will increase awareness about their activity in the community so that more people will get involved in their activities. 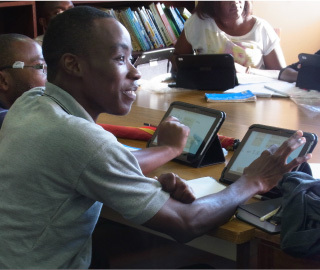 Toshiba Corporation has donated 12 Toshiba AT300 tablets to the Language Centre at the University of Zambia in Lusaka, expanding the centre’s capacity to teach foreign languages to its students, with a focus on its Japanese language course run in association with Hokkaido University in Japan. We were happy to support this programme, as it will surely foster more positive working relationships by bridging communication gaps through the learning of languages. Malawi is facing the worst flood disaster in the history of its existence. A combination of continuous rain and the Cyclone Bansi has resulted in 15 of the 28 national districts being declared disaster zones, leading the country to call for international assistance. The areas affected are predominantly in the Shire Valley and the south. In response to this disaster, Toshiba Africa donated to Gift of the Givers South Africa, who supply basic goods to those affected by the flood.